From the first St. Joseph’s Day altar I ever attended, as a kid, I recall an elderly Sicilian lady who explained why she built an altar. One night, she said, she saw a small apparition of Saint Joseph who appeared on her chest of draws. “He asked me to build an altar,” the lady recalled. That was not a request that could easily be turned down. 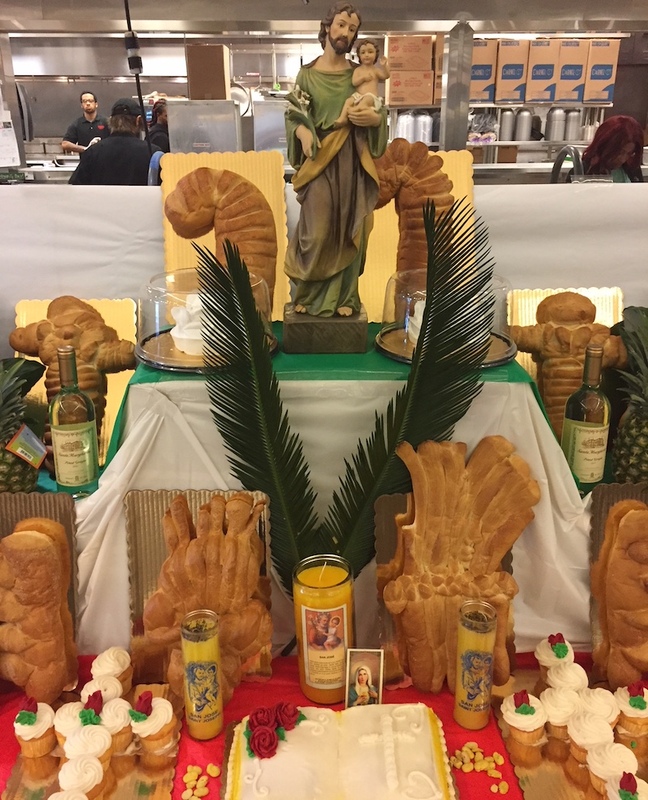 Quite often the altars, which consist of foods displayed in a decorative way; including cookies, pastas, a fish (never meat) and the ever popular lamb cake with coconut icing as its wool, were built in response to a favor asked. Sometimes it was just a tradition from the old country being carried out. Through the years I have visited many altars including one for a woman who wanted to have a child. She built an altar as an offering. After several years she became pregnant and delivered a son on St. Joseph Day. There could be no question what his name would be. This Tuesday, March 19, being St. Joseph Day brings to mind some travel memories. I am not Sicilian, nor Italian, but the reason for my fascination is that New Orleans experienced the largest Sicilian migration in the nation. One especially colorful and meaningful contribution was the altars. While visiting Sicily I was curious about the tradition and how and where it was being celebrated. To my surprise, I got mostly blank stars when I asked about it. Someone might mention about hearing that a certain small village practiced the tradition, but no one was really sure. My other surprise is that St. Joseph, to whom we were told the altars were dedicated for having saved the island from famine, is not a major figure there in the pantheon of Saints. In Europe (where most of the recognized Saints came from) it is more common for every town to have a native saint than to honor a universal figure; thus St. Rosalia is worshipped in Palermo, St. Lucy in Syracuse and St. Agatha in Catania. Joseph just doesn’t have his own town. Then I learned something else surprising, Sicilian is a dying language in Sicily. Most of the younger generation speaks Italian rather than the language of the island. At dinner one night with some Italian fellow-travelers from Brooklyn I realized the truth about ethnic preservation. It survives not in the old country but in the places where the emigrants went. In the United States the language and traditions of the immigrants survives; in the old country the past is overwhelmed by modernization. The Italians from Brooklyn likely knew more about native recipes than most people in Palermo. That’s why, as I discovered, the epicenter of the tradition is really New Orleans. Though there are not as many altars as there used to be, and their locations have gradually shifted to the suburbs, nevertheless here is where the tradition is still practiced. New Orleans' classic shotgun houses were a common setting in the earlier days. Many Italian families lived in half of the house with the front room being overtaken by the altar. Visitors would stop by on the days before St. Joseph Day. On the Feast Day a dinner featuring some of the altar items would be served. As the Sicilian population moved to the suburbs, so too did the altars. In recent years it has been more common to see the altars in a suburban garage or the house’s den. The grandmas who were the driving force behind the altars are fewer. Now they are more of a family enterprise. Increasingly, the altars are becoming institutionalized being built in a church or school area where making the altars is more of a community affair. Where the tradition is practiced in spots around the country it was most likely brought there by someone from New Orleans rather than directly from Sicily. Some customs remain intact. The Times-Picayune still has an altar section on its classified pages in the days before – leave a small donation and you will still get a bag with a few cookies inside and some have fava beans intended to bring good luck. There are still creatively shaped breads, such as those resembling a shepherd’s crook. And a palm frawn is still attached to the front door of a home with an altar to indicate that it is open. On the St. Joseph Day after Katrina we were exploring, seeing if any altars had survived. From the newspaper listing we headed to Gentilly. To my surprise a palm frawn was attached to a FEMA trailer. Inside, a delightful black Creole woman invited us to see her trailer-made altar. There could not be anything more positively multi-culture, and sweeter, than this. At one of the city’s darkest moments the search for a St. Joseph altar would provide hope that the city still had a prayer. Mid-March is always a special time in New Orleans with the celebrations by the Irish on the 17th and the Sicilians two days later. But while the Irish’s St. Patrick’s Day parade is really an extension of Carnival, the altars are spiritual and poetic. St. Joseph might have saved Sicily; New Orleans, in its own way, saved St. Joseph.